MIAMI (April 19, 2018) – SKD has acquired all U.S. distribution rights to the psychological thriller ALTERED PERCEPTION, directed by Kate Rees Davies in her feature-length debut, and written by Travis Romero, creator of the USA series White Collar. Cinedigm will release the picture theatrically and on Digital and TV VOD on May 4, 2018, with a DVD Release to follow in June 2018. When the government attempts to produce a designer drug aimed at correcting the false perceptions that people develop during trauma and stress, the implications are deadly. Advertised as a cure for socio-political tensions, four couples volunteer, but end up with far more than they bargained for as their past and present are examined while taking variations of the new drug. However, this causes them to doubt their own memory, perceptions – and even their own sanity in this thriller in the vein of Disturbing Behavior and The Faculty. Featuring a story by Jon Huertas and Jennifer Blanc-Biehn (Havenhurst, “Dark Angel”), the ensemble cast features Huertas (“This is Us,” “Generation Kill,” “Castle”), Jade Tailor (“The Magicians,” “Aquarius,” “Murder in the First”), Nichola Fynn (“Hot in Cleveland,”, Pirates of the Caribbean: On Stranger Tides) and Matthew Ziff (Kickboxer: Vengeance, Trafficked). Created in 2000, SKD has distributed the work of some of the world’s major directors and box office worthy movies. Synkronized boasts the independent content industry’s preeminent end-to-end supply chain solution for physical and digital distribution. Synkronized is one of the only labels outside of the major studios to be exclusively distributed to the industry’s largest physical content providers (Walmart, Target, Best Buy and Sam’s Club) and is the leading independent supplier to digital platforms including iTunes, Netflix and all the VOD market. With a catalog of over 250 film titles and over 100 TV properties, Synkronized has deals for the ongoing distribution of film titles produced by clients including Paramount, Amazon, LionsGate, SND/M6, Warner bros.,Netflix, Sony, Microsoft, among many others. Blanc Biehn Productions is the partnership of famed actors Michael Biehn and Jennifer Blanc-Biehn. The pair decided to put their passion for acting and filmmaking together, creating their own production company. The duo produced and starred in Biehn’s directorial debut, The Victim, a grindhouse film which co-stars scream queen, Danielle Harris. The company recently released Treachery through Traverse Media and completed post on Jennifer Blanc-Biehn’s directorial debut The Night Visitor and The Girl. They are currently in the sales process with WFT Films on Hidden In The Woods – The Remake. 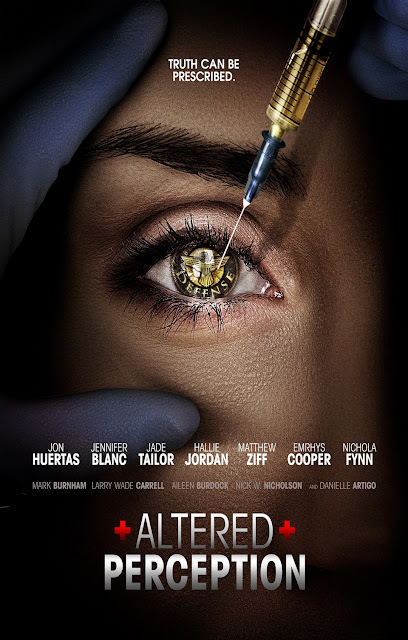 Other films include Altered Perception, She Rises (starring Angus MacFadyen), The Night Visitor 2, Hellavatorman, The Lincoln, Killer Weekend, Good Family Times, and Fetish Factory. Currently in preproduction on Let The Right One In and developing Fembot plus many more. Look out for more releases on their slate as well as festival screenings in the near future, and a new list of fabulous directors being added to the roster. For more information on upcoming BBP features, please go to http://blancbiehn.com to sign up for news and updates. Many projects are currently in post-production with partner and creative executive Lony Ruhmann.